A recent report published by Infinium Global Research on benzoic acid market provides in-depth analysis of segments and sub-segments in the global as well as regional benzoic acid market. The study also highlights the impact of drivers, restraints, and macro indicators on the global and regional benzoic acid market over the short term as well as long term. The report is a comprehensive presentation of trends, forecast and dollar values of global benzoic acid market. 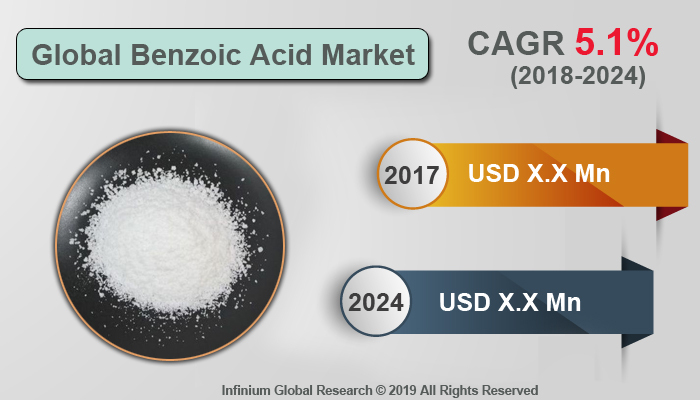 According to the report, the global benzoic acid market is projected to grow at a CAGR of 5.1% over the forecast period of 2018-2024. Benzoic acid is a moderately strong, monobasic aromatic acid, white crystalline powder. Benzoic acid occurs naturally in a number of fruits such as cranberries, greengages, prunes, and cloudberries, and in cinnamon. Benzoic acid is an important precursor for the industrial synthesis of many other organic substances and several salts of benzoic acid are used as food preservatives. It is also used in the manufacturing of toothpaste, beverages, perfume, dye and in poultry, agriculture. The increasing demand for benzene from several end-use industries primarily drives the growth of the benzoic acid market. Benzoic acid is widely used in the food & beverage, personal care industry and pharmaceutical industry. It is most commonly used as a preservative in the food industry as it inhibits the growth of bacteria, mold, and yeast in packaged food products and increases the shelf life of foodstuff. Furthermore, the low cost of benzoic acid and its easy availability boosts the growth of the benzoic acid market. However, enforcement of rules to reduce the usage of chemical preservatives in foodstuffs in the U.S. and European countries inhibits the growth of the benzoic acid market. Besides the food industry, benzoic acid is also a major ingredient in chemical, cosmetic and pharmaceutical industries. Therefore, the growing applications of benzoic acid across several end-use industries generate favorable growth opportunities for the benzoic acid market. The benzoic acid market is a highly fragmented market. The Asia Pacific is the dominant region in the benzoic acid market and is anticipated to remain dominant over the forecast period. The expanding food and pharmaceutical industry in the Asia Pacific countries contributes to the growth of the Asia Pacific benzoic acid market. In addition, the increasing demand for packaged and processed food products owing to the growing urbanization and changing lifestyle boosts the benzoic acid market in this region. Europe holds the second largest share in the benzoic acid market owing to the increasing use of benzoate plasticizers in the automotive industry. The report on global benzoic acid market covers segments such as application, and end-user. On the basis of application, the sub-markets include animal feed additive, benzoyl chloride, alkyd resins, benzoate plasticizers, benzoates, and others. On the basis of end-user, the sub-markets include pharmaceutical, chemical, food & beverages, and others. The report provides profiles of the companies in the market such as Reliance Industries Limited, Shanghai Danfan Network Science&Technology Co., Ltd., Shanghai UBM Sinoexpo International Exhibition Co Ltd, San Fu Chemical Co., Ltd., Wuhan YouJi Industries Company Limited, Chemcrux Enterprises Ltd, SINTEZA, HUANGSHI TAIHUA INDUSTRY SCIENCE AND TECHNOLOGY DEVELOP CO.,LTD., Novaphene, I G Petrochemicals Limited., and Emerald Performance Materials. The report provides deep insights into the demand forecasts, market trends, and micro and macro indicators. In addition, this report provides insights into the factors that are driving and restraining the growth in this market. Moreover, The IGR-Growth Matrix analysis given in the report brings an insight into the investment areas that existing or new market players can consider. The report provides insights into the market using analytical tools such as Porter's five forces analysis and DRO analysis of benzoic acid market. Moreover, the study highlights current market trends and provides forecast from 2018-2024. We also have highlighted future trends in the market that will affect the demand during the forecast period. Moreover, the competitive analysis given in each regional market brings an insight into the market share of the leading players.